This is the 4th generation of the hugely popular Fast Track series and the best yet. The FastTrack 85 is the 2-in-1 bag that won’t weigh you down. Roll it on wheels or carry on your back. A cross between conventional luggage and a travel pack, this is our most popular and versatile piece of travel gear carried by worldwide travellers, gap year students and teams on sports tours everywhere. Heavy duty SBS #10 size zip (normal bags use a #8 zip or less) for the main compartment. This is a strong zip and designed for use on bags that could be put under stress; Straight tube aluminium trolley design maximizes your packing space and reduces weight; Caribee oversized free flow wheels; Concealable harness system with padded hip belt and lumbar support so you can carry it on your back in rough terrain; Unique wheel covers protects your clothing from grime. Dual opening main compartment is ideal for separating your clothing from your footwear; Multiple internal pockets are designed to fit all your necessities; Fully removable internal compression laundry pouch. Very strong nylon construction; Size: 85L (inc. daypack) 70 x 45 x 30cm (main); Weight 4.7kg; Also available in the smaller Fast Track 75 size. Daypack Features:- Action back harness; Main compartment with zip pocket; Front zip sleeve pocket; Twin side mesh bottle holders; Harness attachment clips. If you want really high-quality luggage that is versatile, lightweight, spacious and ultra-tough, look no further. 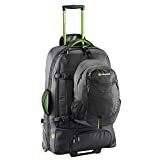 Light weight, modern and practical wheeled luggage that can be wheeled along or carried on your back like a rucksack for more difficult terrain. Comfortable, easy to pack and very light weight and a heavy duty SBS #10 size zip (normal bags use a #8 zip or less) on the main compartment makes the Fast Track 85 a real winner. Rigorously tested by our team, and many world travellers before us, the FastTrack is the best all-in-one luggage solution there is, bar none. Meticulous attention to detail is demonstrated in every aspect, from the ingenious detachable day bag and internal toiletry pouch to the lightweight aluminium trolley frame with its adjustable harness system. Caribee is the market leader in Australia for luggage and travel essentials, backpacks and rucksacks. Caribee has 50 years experience so you can have complete confidence you are getting well designed products and great value for money. Caribee use only the best quality materials, zips and straps on all their travel goods. You can see all the Caribee products on Amazon. This is the 4th generation of the hugely popular Fast Track series and the best yet. This small duffel style toiletry bag is just the right size for a quick trip up the coast or a weekend away.